On Friday, July 9, Chick-fil-A restaurants nationwide will celebrate the company's annual Cow Appreciation Day event by offering a free meal to any customer who visits one of the chain's mall or stand-alone restaurants fully dressed as a cow. 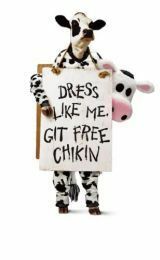 Customers dressed "head to hoof" in cow attire will receive a free Chick-fil-A meal, which includes an entree of choice, a side item and a Dr. Pepper (or other beverage choice). For customers partially dressed in cow attire, such as a cow-spotted scarf, purse, hat or other accessory, Chick-fil-A will award a complimentary entree. Two online photo contests are also part of the festivities. A photo contest for adults is hosted on the Chick-fil-A Facebook page. A second photo contest for kids 10 and under called Show Us the Cow is available at www.showusthecow.com. Both contests will award free Chick-fil-A products for a year to the best cow-dressed customers, and children will also have the opportunity to win a $1,000 U.S. Series EE Savings Bond and a digital camera through the "Show Us the Cow" photo contest. "Cow Appreciation Day continues to be one of our best indicators of the great passion our customers have for our brand," says Steve Robinson, Chick-fil-A's senior vice president of marketing. "It takes a loyal fan to dress like a cow for a free meal. Cow Appreciation Day is our way of thanking them for their loyalty, not to mention a day simply to have fun." For the past 15 years, the renegade "Eat Mor Chikin" Cows have entertained consumers with their desperate, self-preserving antics in an effort to convert beef eaters into chicken fans. The Chick-fil-A Cows and the "Eat Mor Chikin" campaign have enjoyed such widespread public success that the chain has evolved the campaign into a fully integrated marketing program. In addition to clever roadside billboards, the "Eat Mor Chikin" Cows are the focal point of Chick-fil-A's in-store point-of-purchase materials, promotions, radio and TV advertising, and clothing and merchandise sales.